YRCW is a leading transporter of industrial, commercial, and retail goods, specializing in solutions for businesses across North America as well as internationally through a full-service network, advanced information technologies, and proactive customer service. Several years ago, they introduced a rewards program to give customers incentives for increasing their monthly shipments. They introduced a prepaid card from OmniCard into the program. Clients access a custom website to redeem their rewards and can select a prepaid card option. Many customers bank their points for several months to create a more sizeable reward. In several cases, YRCW clients have been taking the cards in lower denominations, like $25, to use as giveaways and employee incentives. The prepaid card option has been the most popular aspect of their program and clients are excited when they receive their monthly rewards. 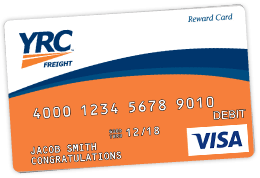 YRCW was using a program through American Express and decided to switch to OmniCard. The team at OmniCard was able to customize a solution with a branded prepaid card, online ordering, and live customer service support. The support service was invaluable to YRCW because it ensured their customer questions were handled promptly and correctly with no additional work needed by YRCW. The flexibility to order different card amounts and track card balances and activations online has simplified the process of managing the program.